This is the latest hinged handcuffs from Alcyon. 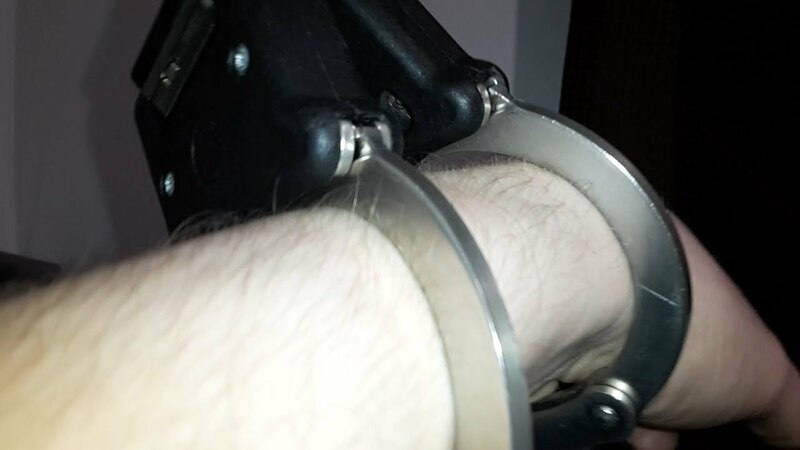 The Alcyon hinged handcuffs model 5005. These are a high quality handcuff. They are Spanish and have a very smooth operation and the double locking mechanism is very stiff meaning there is no chance of accidental engaging and mechanism to disengage it is very smooth, as with the black chained ones I overviewed early on this channel. I have since learned that both pairs of my Alcyon handcuffs have sloppy tolerances with regard to double locking. This came to my attention when I gimmicked my TCH800 cuffs to allow them to pull open. Yet when I double lock them they are seemingly as secure as if I had not gimmicked them and refuse to open without using the key. I also did this gimmicking process to these Alcyon hinged handcuffs. However I noticed when I double locked them, they would still pull open to a large degree, not fully but they were no longer "secure". So I opened them, double locked them and then pressed down on the pawl bars. There was a lot of downward movement. So, while new, non-worn out cuffs are secure when double locked (Alcyon), if the teeth get worn down a bit they may slip and pull open or close further accidentally because the pawl bars are NOT statically unable to move. TCH, for example, will not move at all. Nor will Peerless. Alcyon should, in my opinion, improve and tighten the tolerances so that when the double lock is set, the pawl bars have zero movement potential.